Heavy Duty Green Dome Exit Push Button. 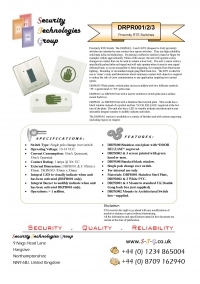 To download this brochure please click on the image on the right. 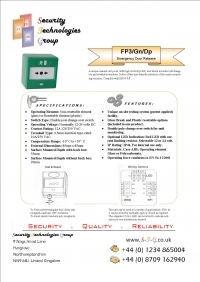 Double Pole Green Emergency Door Release with Resettable or Glass Break (included) and LED status indication. 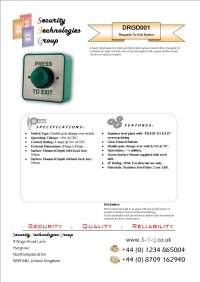 Proximity RTE (Request-To-Exit) switches intended as a non-contact door egress switch, ideal for clean rooms etc. All rights reserved. Farpointe Data, the Farpointe Data logo, Pyramid Series Proximity, and Pyramid Series logo are registered trademarks of Farpointe Data, Inc. Ranger and Delta are trademarks of Farpointe Data, Inc. Mifare is a registered trademark of NXP Semiconductors. HID and the HID logo are registered trademarks of HID Global Corporation, an ASSA ABLOY company. All other trademarks are the property of their respective owners.